Crated by the hundreds and deprived of food, water, and sunlight for days up to weeks, poached parrots die of stress, suffocation, malnutrition, and injuries. Every year, 800,000 parrot chicks are poached in the wild to support a lucrative global pet trade. Further exacerbated by parrots’ low reproductive rates, numbers have been rapidly declining for the past several decades. Up to 90% of wild-caught birds die in transit because of cruel and inhumane conditions, deprived of food, water, and light for days, often weeks. For every captured bird that reaches a pet store, three others have died during capture or transport. 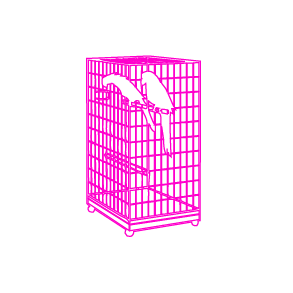 Wild-caught birds never fully adjust to life in captivity and are not suitable as pets. Others who do not end up as pets are sent to parrot mills to breed in depraved conditions to supply pet stores nationwide. Never buy a wild-caught parrot! Illicit wildlife trafficking, now a $19 billion enterprise², is the second largest global black market behind drug smuggling. Wild parrot populations are being devastated by poaching, which primarily occurs to fuel the pet trade. Of the 350+ known parrot species, 100 are listed on the International Union for Conservation of Nature’s (IUCN) Red List of Threatened Species; of those, 66 are threatened directly by the illegal parrot trade³. The Convention on International Trade in Endangered Species (CITES), which sets certain export quotas for individual species, still allows for legal trade in endangered species, including parrots. According to CITES, 80,000 birds are legally traded annually⁴; however, because of high mortality rates associated with poaching, up to four times as many birds are captured to compensate for deaths in transit. Over 800,000 chicks are poached every year⁵, and the majority of captured birds do not survive the horrific ordeal. Crated by the hundreds and deprived of food, water, and sunlight for days up to weeks, poached parrots die of stress, suffocation, malnutrition, and injuries. Parrots’ reproductive biology – in conjunction with rampant chick poaching – further hinders their chance to repopulate numbers in the wild. Parrots have a naturally low reproductive rate⁶: they take many years to reach sexual maturity, and are often caught before they even have a chance to reproduce in the wild. Many species of parrots are monogamous, and pairs that are split up will rarely find another partner. With such a high proportion of nonbreeding adults, as well as small and infrequent clutch sizes, poaching spells disaster for the future of parrot populations. Conservation education is a necessary tool for protecting endangered species. Donate to support education programs in the field! “Fighting illicit wildlife trafficking: A consultation with governments.” WWF. Web. 2 May 2014. Gastañaga M, Macleod R, Hennessey B, et al. A study of the parrot trade in Peru and the potential importance of internal trade for threatened species. Bird Conservation International 21(1):76-85, 2011. “Global Trade in Wild Birds.” CITES Trade Database. Convention on International Trade in Endangered Species of Wild Fauna and Flora Trade, 2013. August 4, 2013. Beissinger, S. R.. “Trade of Live Wild Birds: Potential, Principals and Practices of Sustainable Use In Conservation of Exploited Species.” Cambridge University Press, Cambridge, UK, 2001. Pollock, Christal. “Conservation Medicine: Understanding the Illegal Pet Trade.” Lafeber Vet, April 20, 2013. January 17, 2014.